For the first time this season, the No. 7 Cal women’s swim and dive team’s roll hit a snag as the team dropped a heartbreaker to No. 5 USC, 153-147, on Friday. The Bears, however, throttled No. 18 UCLA, 185-114, on Saturday to close out their first dual-meet road trip of 2016 on a strong note. 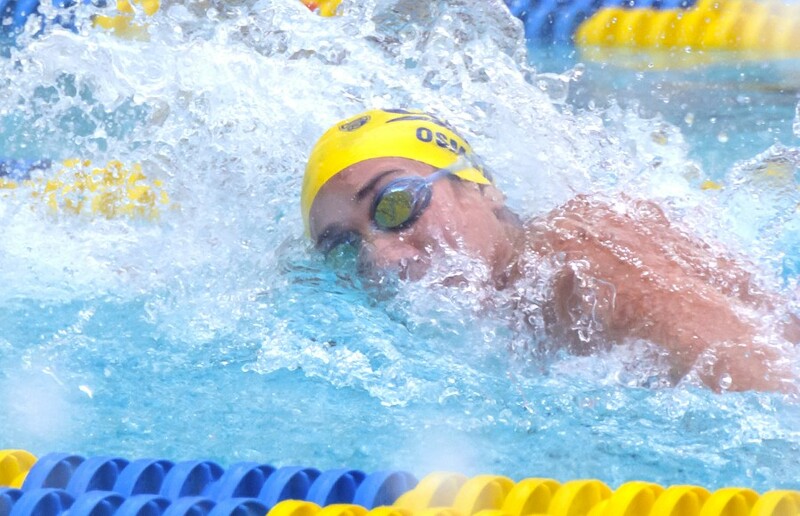 In a tightly contested meet where both teams held leads for what felt like only moments at a time, Cal and USC put their competitive fire on full display at Uytengsu Aquatics Center. The Bears entered the final event of the night leading the Trojans by a slim margin. USC was just able to knock off the defending champs with its 200-yard freestyle relay squad, headlined by junior Anika Apostalon. The Trojans clocked in at 1:30.64 to the Bears’ 1:31.71 time. 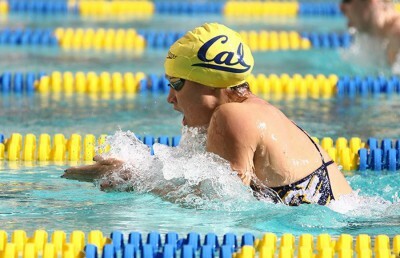 Cal’s excellent freshman duo of Kathleen Baker and Amy Bilquist continued to impress over the course of the weekend. They each won two races against the Trojans, with Baker taking the 500-yard freestyle event in 4:45.49 and the 100-yard backstroke with a 52.95 time. 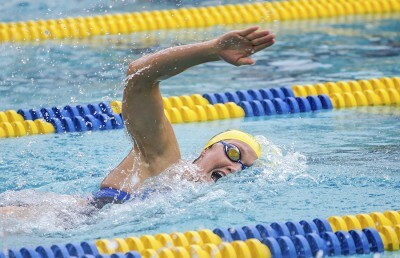 Baker’s freestyle time was the fastest this season in the event for any Cal swimmer. Meanwhile, Bilquist won the 200-yard freestyle event with a time of 1:47.12 and also was victorious in the 200-yard backstroke with her 1:55.86 time. Senior Kelly Naze also had a strong set of performances in the Bears’ losing effort against USC, as she took the 200-yard butterfly with a 1:56.23 time and edged out her sophomore teammate Noemie Thomas, who finished at 1:56.58. She also had a second and third place finish in two other 200-yard events, the individual medley and backstroke, respectively. Despite dropping their first meet of the season to a talented USC team, the Bears were seemingly unfazed as they trekked to Westwood for their next task. 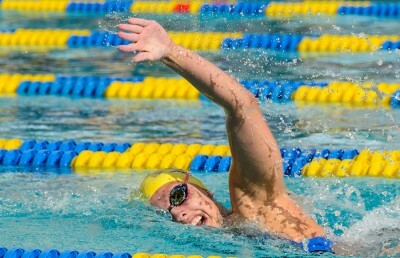 After an almost two week period of rest between dual meets for UCLA, the Bruins were dominated by Stanford, 182-118, on Friday and looked to turn the tides against Cal on Saturday. They were unsuccessful. The meet between the two conference rivals who were reeling off of losses saw Cal come out of the gates strong. The Bears took the 400-yard freestyle relay with their team of senior Rachael Acker, junior Kristen Vredeveld, Bilquist and junior Farida Osman who set a pool record with a 3:20.78 time. If not for Stanford sophomore Janet Hu setting the record the previous night with a 52.69 time in the 100-yard backstroke, Bilquist’s first place time of 52.75 in the event would’ve been the pool standard. The dual meet also saw the Bears bounce back with strong performances all across their roster. Cal’s depth in the shorter events was on full display as the Bears put forth a 1-2-3 finish in the 50-yard freestyle with Osman, sophomore Valerie Hull and Vredeveld sweeping the event. Bilquist, Acker and Vredeveld went 1-2-3 in the 100-yard freestyle. The Bears, buoyed by Thomas, senior Rachel Bootsma and Osman, also swept the 100-yard butterfly. Thomas also won the 200-yard butterfly with a 1:58.11 mark that put her in front of two UCLA seniors, Katie Kinnear and Arlyn Upshaw. Though the results from the weekend included the Bears’ first significant slip-up of the season, the team’s response to heartbreak with a dominant effort against UCLA was a testament to the resolve that the program has built. Cal will need to continue believing in its ability to execute against top-ranked competition as No. 2 Stanford awaits it, with both teams looking for the opportunity to assert themselves as the top dog in the Pac-12.